Before I customized it, it looked like two lines of random letters and numbers. It did not reflect positively on me—nor did it look good on a business card, proposal or email signature. The good news is that creating a unique URL is easy. From the ‘Profile’ menu (to the right of ‘Home’), choose ‘Edit Profile.’ From there, below your headshot, you will see your current LinkedIn URL. Next to the URL click ‘Edit.’ On the page that opens up, find the option to ‘Customize your public profile URL.’ Enter your desired URL and click ‘Set Custom URL.’ You’re done! 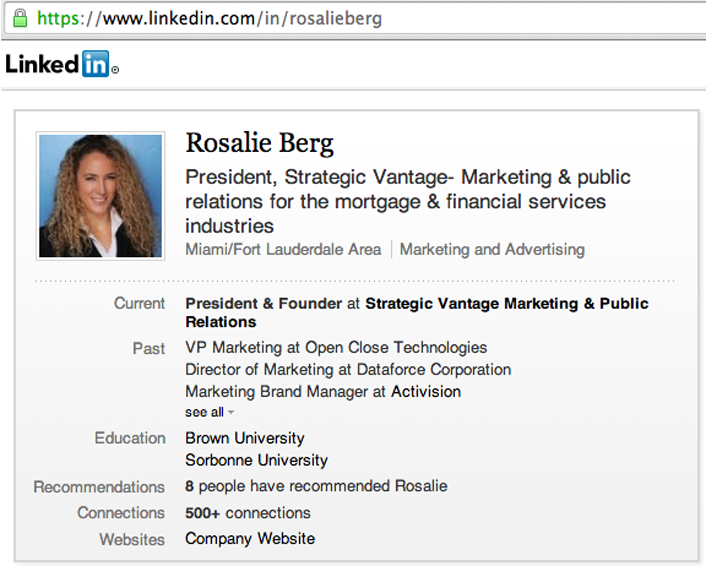 The headline of your profile is critical because it’s tied to the search feature in LinkedIn. If your headline includes key search terms under which people can find you, then you’ll come up at the top of search results. My headline, for instance, is “President, Strategic Vantage Marketing & public relations for the mortgage & financial services industries.” Make sure you also use keywords in other sections of your LinkedIn profile, as that will help you rank higher in LinkedIn searches. Families, puppies and loved ones make great photos—but not on LinkedIn. This is the place to feature your professionally taken headshot, excluding the photo of you in a tux at a wedding. If you’re using LinkedIn for business, your photo should be a business headshot representing you as you want your prospects and clients to see you. It should also be current. If you have changed your look or the photo is 10 years old, it’s time to replace it. No headshot? Yes, that is a problem. Just go to a local portrait studio or hire a photographer to take one. No LinkedIn profile should go without a photo. While LinkedIn provides a canned statement you can use to request that someone connect to you, it’s best to avoid using it. Using the default “I’d like to add you to my professional network on LinkedIn” message makes you seem indifferent, while a personal note only takes a second to write. Even better, send contacts a question so they are compelled to engage with you. The greatest power behind LinkedIn is in groups. These discussion groups are where topics are addressed, questions are answered and opinions are voiced. LinkedIn’s groups are an active platform for individuals to engage, create lasting impressions and influence opinions. Groups also help draw in business leads, drive traffic to your website, position you and your company as thought leaders, build credibility, and ultimately, grow a business. The trick behind LinkedIn groups is to be proactive. So how do you get involved? Click here to find out. We wrote a whole blog on this topic alone! LinkedIn can be an invaluable tool to grow your business and your exposure. But if you want real results, you can’t just dabble in it. You need to know how to really use it. Email us at Info@StrategicVantage.com if you’d like assistance with your social media.